Your daily hustle may demand that you’re active and enthusiastic all the time, but if you don’t take good care of yourself, it may ultimately take a toll on your physical and mental well-being. While travel can be a goodremedy for this, what matters is the type of travel you do, and whether it helps you bounce back from the daily grind. Consider wellness retreats! The purpose of this type of travel is to improve your holistic health while giving you an essential break from your routine. These types of retreats often include exercise, spa treatments, healthy food and plenty of opportunities to expand your creative and spiritual sides as well. And when it comes to wellness travel, there are plenty of physical activities for everyone: yoga, trekking, walking tours, or nature adventures. Some feature fulfilling endeavours like educational programmes, volunteering or charity activities. So how exactly do you benefit from wellness vacations? Wellness travel is not just for rejuvenating or reducing your stress levels; it has many benefits to offer far beyond that. A wellness trip may include indulging in culinary events, in which you can learn and try out healthy food recipes. Physical activities that you participate in on a wellness holiday can help you to lose weight, which will in turn make you feel good in both mind and body. And by taking part in certain physical tasks, you’ll be more likely to incorporate some of them into your daily life in order to stay in fit even when your vacation in over. Some wellness trips focus on connecting with nature. This can help one improve concentration, strengthen cognitive skills, increase self-esteem and enhance overall awareness. And when it comes to holidays that include volunteering or charitable activities, the act of serving or donating for a good cause will not only be deeply rewarding, but can also improve your sense of well-being. Of course, yoga and meditation retreats have become quite popular and a favourite wellness option to many. Whether it is a spiritual delight for your senses or a peaceful relaxation sanctuary, yoga and meditation retreats offer abundant experiences and opportunities to work on your well-being. When it comes to these type of retreats, some people have preconceived notions that they include eating unpleasant food or just sitting around and chanting all day. Nowadays, however, each retreat offers a unique combination of treatments and activities to choose from. The health benefits of yoga and meditation retreats are exceptional. A majority of meditation and yoga retreats are situated in beautiful natural locations where you can connect with nature on a deeper level. One of the great benefits of this kind of retreat is that you will be surrounded by positive feelings and thoughts. Other benefits include meeting new people, having time for yourself, and discovering new perspectives on life. 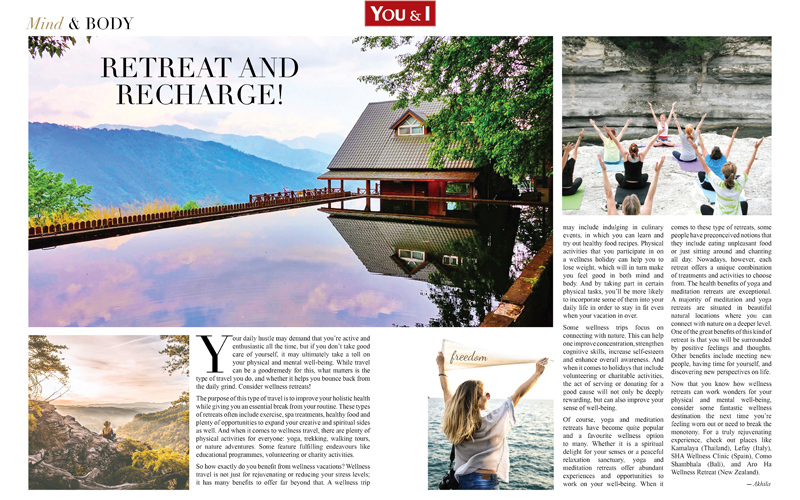 Now that you know how wellness retreats can work wonders for your physical and mental well-being, consider some fantastic wellness destination the next time you’re feeling worn out or need to break the monotony. For a truly rejuvenating experience, check out places like Kamalaya (Thailand), Lefay (Italy), SHA Wellness Clinic (Spain), Como Shambhala (Bali), and Aro Ha Wellness Retreat (New Zealand).